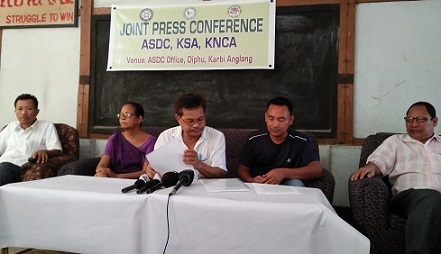 The Autonomous State Demand Committee (ASDC) and frontal organisations Karbi Students’ Association (KSA) and Karbi Nimso Chingthur Asong (KNCA) have called for a 24-hr Karbi Anglong district bandh from September 4. The bandh will remain effective from 5 am on September 4 to 5 am on September 5. The bandh has been called with a demand to pressurise the Central Government for holding tripartite talks on creation of a separate autonomous hill State carving out of Karbi Anglong, West Karbi Anglong and Dima Hasao districts. It may be recalled that police firing took place at Bokajan on September 3 and 4 in 1986 during a bandh called by the ASDC, KSA and KNCA. Terang further said that the ruling BJP leaders, starting from Union Home Minister Rajnath Singh to Union Minister Nitin Gadkari have failed to fulfil the promise of creating an autonomous State, which they had made during their election rallies. The ASDC also stated it has launched its ‘second phase’ of movement demanding statehood with submission of a memorandum to the Central Government through a mass rally last March 26 in Diphu for creation of a Hill State. “The Central Government has not responded to this,” it added. Terang requested the people from Nagaland and Manipur to support them during the 24-hr Karbi Anglong bandh stating that “it is a genuine demand of the people of Karbi Anglong”. NH 36 and NH-39 cutting across the district will be affected during the bandh. The press conference was also attended by president, KSA, Suren Hanse, president, KNCA, Merina Beypi and others.